The park known as Madison Square (named for the president and principal author of the U.S. Constitution) is at the junction where Fifth Avenue and Broadway momentarily converge as they head downtown, only to be separated by the prow of the Flatiron Building on 23rd Street. In the mid-19th century, as the opulent Gilded Age got under way, the surrounding streets grew lush and residential. Lavish Beaux Arts- and Rococo-style grand hotels and retail emporiums arose. This was Theodore Roosevelt and Edith Wharton territory. Herman Melville wrote Billy Budd on East 26th Street. The grid of streets around Madison Square Park became Manhattan’s hotspot. Fast-forward to 2011, and now again, this is the place to be. In 2004, the park and environs reawakened. That was the year when that ivy-covered gourmet snack bar, Shake Shack, opened amid the park’s greenery, attracting huge crowds. Other restaurants followed, the most recent of them being the Italian mega-food hall Eataly, situated directly opposite the street. And nearby: Nuela (a haute Nuevo Latino cevicheria), and the John Dory Oyster Bar. What’s more, elegant hotels have re-emerged—the ultra-trendy Ace Hotel, the Eventi, the NoMad, the MAve, the Carlton, and the Roger Williams. So once again, it’s a chic locale. Naturally, we at Bond No. 9 had to give this vivacious neighborhood its own vivacious eau de parfum. So for April 15, we are delighted to introduce Bond No. 9 Madison Square Park, an arresting, super-bright mélange of romantic florals and crisp greens. Starting with springtime topnotes—intoxicating, musk-like grape hyacinth paired with tangy huckleberry and delicately spicy prairie dropseed grass—the scent soon segues into a heart of voluptuous red leaf rose, traveling with its sidekick, Red Hunter tulip. And for its finale, these lush and vibrant florals at last give way to calmer, deeper, darker teakwood and vetiver root. Madison Square Park was developed by perfumer Laurent Le Guernec. The tacky in me just loves that bright pink and green bottle!!! Has anyone smelled the New York Oud that was just released? I actually like it, too. But I suspect what I *really* like is the bracelet. I am totally loving the bottle and the flower. You have to hand it to Bond No. 9 they do great packaging. New York Oud smells like Playdoh on me, but I really like it. Then again, I’m not a big oud fan. … am I the only one who wants this bottle to be any other color? I love the rose though. But how lovely it would be with a pure white bottle and a yellow rose. No? I work across the street from Madison Square Park and have to say I am disappointed that this does not smell like my favorite thing about the park, i.e. a Shake Shack hamburger with a beer and a side of cheese fries. Still, I think it sounds nice. “Super-bright” as a descriptor has piqued my interest. If I worked across the street from SS, I would weigh a gajillionty pounds. HA! Cheese fries, hmmm, haven’t yet seen that as a note in a fragrance! Beautiful bottle – and love the green rose, but I don’t really get the whole detachable junk-jewellery-on-perfume-bottle thing! I would probably leave it on the bottle. I do like the color scheme too, somehow. The scent — who knows; sounds like it could be a screechy floral. However, the first thing I though upon seeing the flower was that it seemed like a bit of a ripoff of MJ Lola. Yeah, except they weren’t first with the idea either. I can’t imagine something that screams ‘gilded age’ LESS than this. To be a n00b, tldr. Jeez, I saw that wall of text and my eyes glazed over. Seriously, that is probably the longest fragrance description I’ve ever seen. I wonder if the restaurants paid for the name check? I too am suckered into the cute bottle, but on me, Bond is an iffy brand. The concept here is all over the place–the bottle says psychedelic mod meets bubblegum pop… the notes say fussy prissy prep school girl who tries to get into bars on the weekend… and the neighborhood it commemorates is flooded with 20-30 year old quirky young things bustling to their jobs in publishing houses and architectural firms wearing funky German glasses. So funny, love the comment. Psychedelics are trying for prep school cool and failing out at bubblegum. Perfect description of the eternal wannabe. Sounds like a mess of a scent. Remember the song Psychotic Reaction by Count Five? We’re there. Forget the bracelet–that bottle should come with a pair of sunglasses. I am just not into screaming hot pink combined with acid green. I was afraid I was the only one who was appalled by this. Honestly, I would NOT want this bottle even if I loved the juice. My Saks has this in and I tried it today (only on a card, which I still have). It progresses this way: FRUITY, floral, GRASSY, fresh. No sign of deeper, darker anything. It’s kind of nice and springy in a Gap Grass-plus way… I just don’t think one needs to pay B9 prices for that. At least I don’t. Thanks, I had wondered what on earth this one actually smells like. If I was to spend $170 on perfume, I could make it go a lot further than this. Bond Fragrances are always a Crap shoot! They can be real tricky, sometimes they are wonderful and sometimes PURE DRECK-ITUDE! This is the first time I want a fragrance just for the bottle! 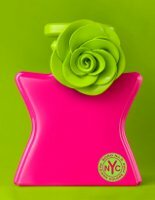 Funny that there are so many gorgeous bottles out there, but my choice would be hot pink with a lime-colored fake flower??? Not odd at all – it is delectably camp! Gorgeous bottle, as always I’m interested in tryin anything Bond. I do have a weird feeling that nothing can beat the old bonds tho, One of my very first perfume love affairs was Park Avenue. No other perfume is as subtle, delicate and drop dead gorgeous as that chamomile-paper white mix. I also adore Chinatown, Little Italy, Nuits de Noho and Gramercy Park. I will always try new Bonds but I don’t think any new ones will ever touch my heart as much as the very first line did. My opinion. Love Madison Square…but I would like to say it smells EXACTLY like the women’s Perry Ellis 360. Just got my sample in the mail this weekend – to my nose, it’s much more fruity than the notes suggest (melons?? ), and the florals are pretty quiet, which is OK with me. It’s a sheer, nondescript scent, good for the office or anywhere you don’t want an intrusive perfume. I’ll probably use up my sample, but wouldn’t purchase a full bottle. Nothing special.